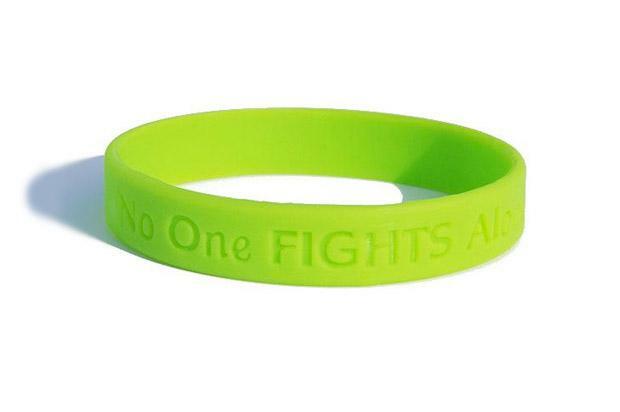 On behalf of Brittany’s Mom and Dad we would ask you to join us in wearing a bracelet entitled “NO ONE FIGHTS ALONE.” The bracelet is lime green which is the color for Lymphoma. We will be glad to send you a bracelet all you have to do is leave your name and address in the “Leave Reply” below and we will be sure you get one. Brittany is very special to us and we know many of you and we want her to know that we are in this together. God Bless You. I would love to have my bracelet again!! Please and thank you!!! My mother in law bought me one of these and I wore it every single day, and got tons of compliments wondering where I got it from so they could know where to BUY there own…. My glorious wife CHRISTINA Marie Jefferson. And all of my family and friends plus all of my UNION BROTHERS held an astonishing Steven Jefferson Lymphoma Cancer Benefit,thousands of people showed up to supprt my sickness and my Recovery!!! It made me feel so GOOD!!! If you could please send me a handful of them I would be so GRATEFUL AND YOU CAN KNOW THAT GOOD THINGFS WILL CONE YOUR WAY!!! Thank you so very much!!! I would love to get several if them to give to my people who stood by my side when I was in the hospital for 8 months!!! BUH!!! My wife’s mother bought me one of these for Christmas but it snapped in half because I wore it every single day, and I loved it to death!!!!!!! I will definitely support Brittany in her time of need!!! I was there, I spent seven months In a hospital bed just dying inside but outside I just wondered how I felt, I Caught a rare really rare brain cancer-CENTRAL NERVOUS SYSTEM LYMPHOMA, it’s really bad and the Doctors at northwestern hospital in Chicago said not a lot of people live through what I did, but I’m here back home with my beautiful wife and our two young beautiful children, thank the higher power for giving me TGE strength to push through it!!! and thank you most CHRISTINA MARIE JEFFERSON, my darling love and SOULMATE!!! I love you dearly babycakes!!! Please send 2 bracelets. I will def support Brittany by way of prayer & wearing the bracelet. God Bless! My address is: Gary Uribe, 407 Sautner Drive, San Jose CA 95123. If I could please have a few of these so I could give them to some friends who went to school wih Brittany. We are all praying for her here in Trenton. We know she is a very strong young woman. My address is 746 NE Hwy Y Trenton Mo 64683. I would gladly pay for the bracelets as well as shipping if you could let me know where to send the money. Thank you! Praying for you everyday. If you could send me one for me and 2 more for my parents that would be awesome. We love you and know you have big things in front of you! Hey I got the Braclets! Thanks soo much for them, put it on as soon as I got it and all my clients have been asking about it! So to say the least all my clients are praying for you to! Glad to hear about the PET scan to, Keep up the good work!